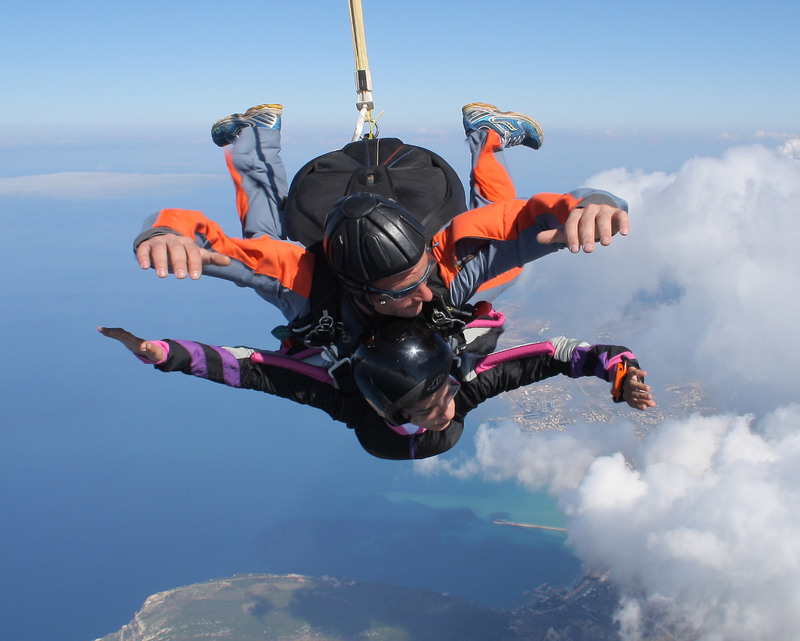 Most of the hang gliding and paragliding training is similar. 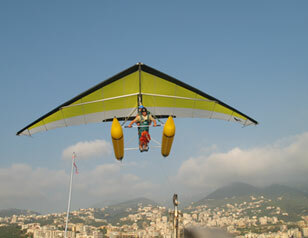 LACH-INTERAVIA offers you the possibility to learn how to fly and to obtain your novice level from the Lebanese ministry of sports, Hang gliding department and signed by the United State Hang Gliding Association after passing of your written pilot’s exam and accumulate enough flight hours. The training is divided into several steps and takes place as private lessons either with an instructor or in small groups. The school's size, structure, and the number of instructors allow us this special treatment. This has the advantage of being able to adapt the training to the abilities and availability of each person and to progress faster and more securely toward autonomy. To begin a course, there is no fixed schedule. You just have to call us and make an appointment for the day you choose. During your first lesson, you will discover the material. You will get to know the wing and how to handle it on the ground and in the wind. This step is relatively short compared to the rest of the training, but is essential. The first step generally takes place on flat ground. You learn to assemble and disassemble the wing. You will make a few runs on the ground in order to learn to maneuver it. A one-hour lesson is usually enough for this step. The following steps consist of practicing the take off and the landing stages. At the school, your progression will be secure; because of the grass covered school site is specifically adapted to hang gliding activities, you will be able to face the wind direction most of the time. Wing control, take off runs, wing handling and landings are the important points of this stage. For hang gliding training, you will need approximately five one-hour lessons on the school grass site. At the same time, during school site practice, tandem flights on a motorized hang glider (ULM) with an instructor will be given in order to assimilate altitude flying techniques and landing approaches. Three lessons of 30 minutes each are generally needed to bring you to the next step: been towed to a high altitude for your solo flights. Obviously, the next step is mountain flights. This is generally the most awaited moment for students. It is now time to implement what was learned previously. Your first mountain flight from the top takes place during the evening because of the still air in order to make the flight safe and very pleasant. There are two instructors assisting you, one at the take off on top of the mountain and the other at the bottom of the mountain, both radio-linked with the student. They will guide him through the take off, the flight and the landing. Once the flight maneuvers are assimilated in calm still air, students can therefore think about flying midday, into turbulent air. The last step is the most gratifying. The student under his instructor's supervision will make his/her first thermal flight. The aim of those flights is to learn how to use thermal lift to fly as high and far as possible. You will learn how to control the wing in order to extend the flight duration, the pleasure of flying, and eventually go cross-country flying. As soon as the student is able to fly in different air conditions, he/she is declared self-sufficient by the school instructor that authorizes him/her to fly alone without supervision. In total, you will need between 25 and 30 instructor-supervised flights to gain full autonomy. The first flights (around 15) happen during the evening when the air is still and calm. The next flights will take place during the afternoon or evening in conditions adapted to the student level. Each flight has a different price rate, depending on the needed supervision. Although most of the training is practical, some theory will be taught along with practical training. 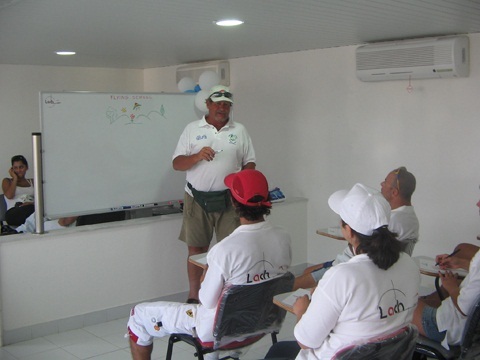 In addition, an eight-hour theory class is part of the beginner pilot's training. This course will cover different subjects such as meteorology, flight theory, flights regulations, air safety, aerodynamics, etc. All the equipment is furnished during your course. If you want to keep on flying with your own wing afterwards, we can advise you on the best choice of equipment for you and offer you our products.